No, there was not a “Day One” post. i was too tired to post anything last night and just fell asleep in the recliner. I woke up this morning around 9AM, solely because Harvey decided he wanted to go out. I stumbled around, made a cup of coffee, and decided I should take Harvey for a walk before I started Day Two. We returned home, I sat down in the recliner with my second cup of coffee and contemplated falling back asleep. All of my muscles hurt. Ah, but that second cup of coffee worked miracles, and I was up and at ’em by 10:00. I started the laundry and hauled out the clothesline to greet the sunny and beautiful Palm Sunday. I located my garden gloves, the edger, the shovel, my knee pads, and all the other accoutrement necessary for making it through a second day of marathon gardening. You have to grab every opportunity here when the sun is out in April! Yesterday, I took the edger and straightened out all the lines around the “island”. Today, I was undertaking the prayer garden. I wasn’t the only person out there. 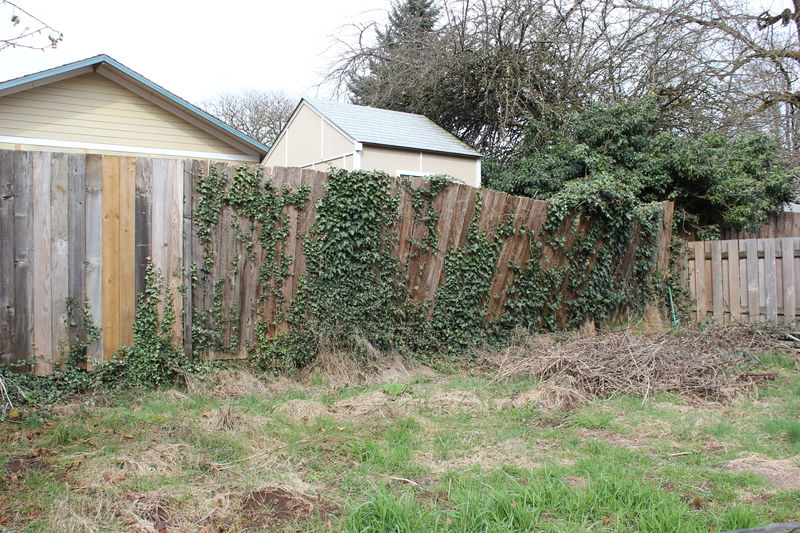 My next-door neighbor who lives behind us caught me at the grocery store where she works & I shop: she wanted me to know the ivy and the fence were coming down. I loaned them our yard debris can after they filled theirs. I figured it was for a good cause: to keep their dogs in their yard and our dogs in our yard, and to keep them as good neighbors. 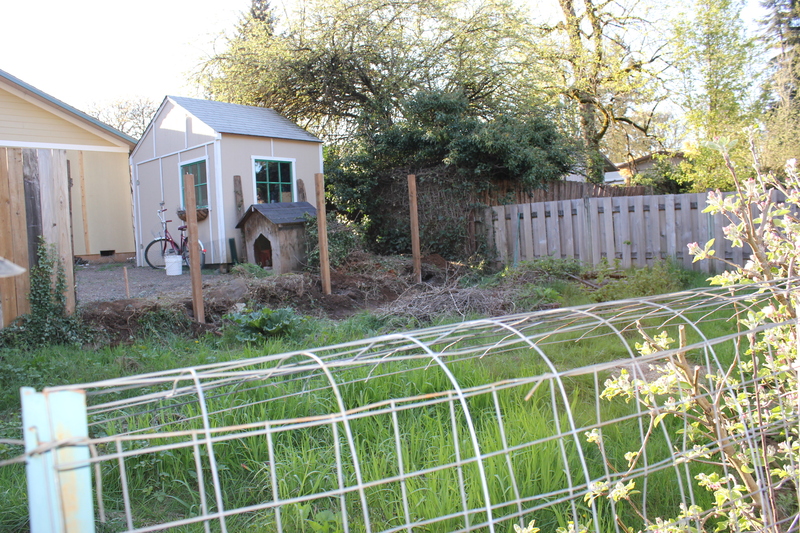 Their dogs did come over into our yard during the destruction of the fence, but they only wandered around in the weed-pile that is our fenced-in veggie garden. Harvey, of course, wanted to go in and play with them. These neighbors have two Labs, a black one that listens as well as Murphy does, and a yellow one that is relatively obedient. 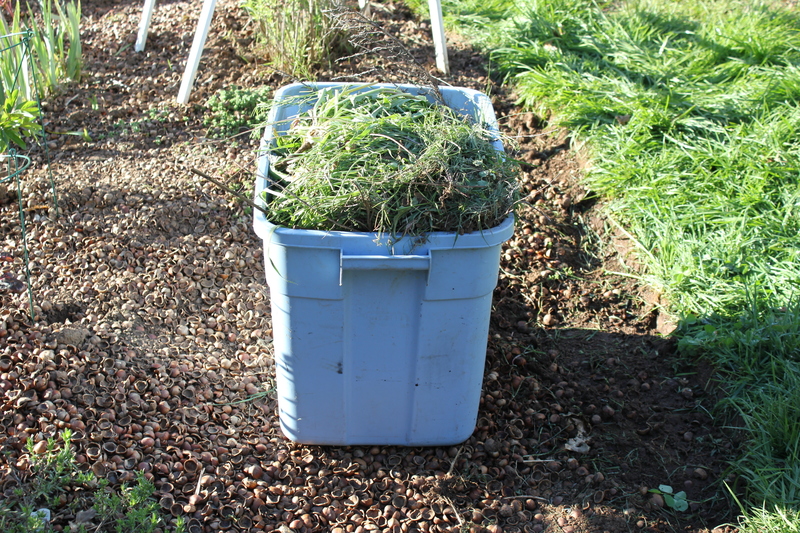 While they did that, I filled up a tub with my own yard debris. I’ll put it in our big container next weekend. Today, I covered up the hole in the bamboo that Harvey chewed. I weeded 75% of the prayer garden and 75% of the southern border. You can see the second layer of bamboo screening in the background. Rather than taking the old screen down, I supplemented it with a second layer. It helps keep the view of the back yard neighbors to a minimum (this is the other set of neighbors that live behind us. You can’t see their house or them from this angle, and that’s fine with me. I’m not very fond of them). The brown house in the photo belongs to our southern neighbors and I adore them. I filled three buckets with yard debris. I tossed fern fronds onto the brush pile on the other side of the shed. 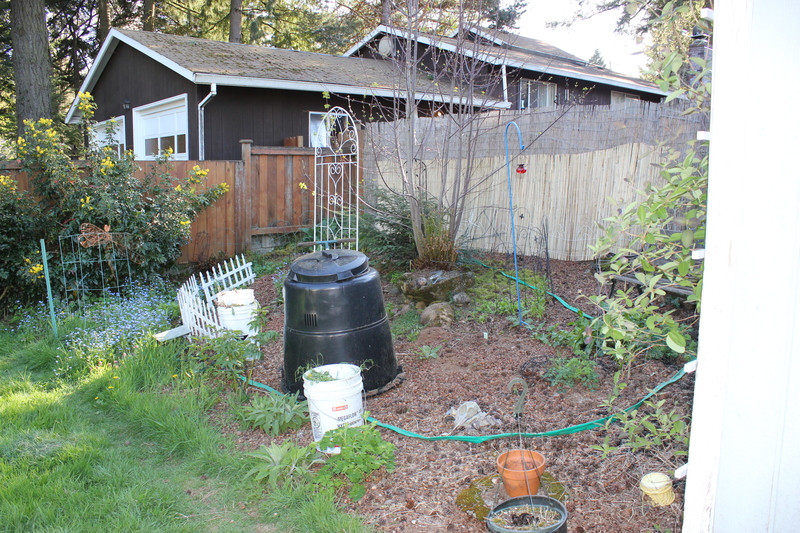 I pulled out the compost bin because I think I have a better spot for it, closer to the back door. A sunnier spot that will heat the bin and compost the materials more quickly. 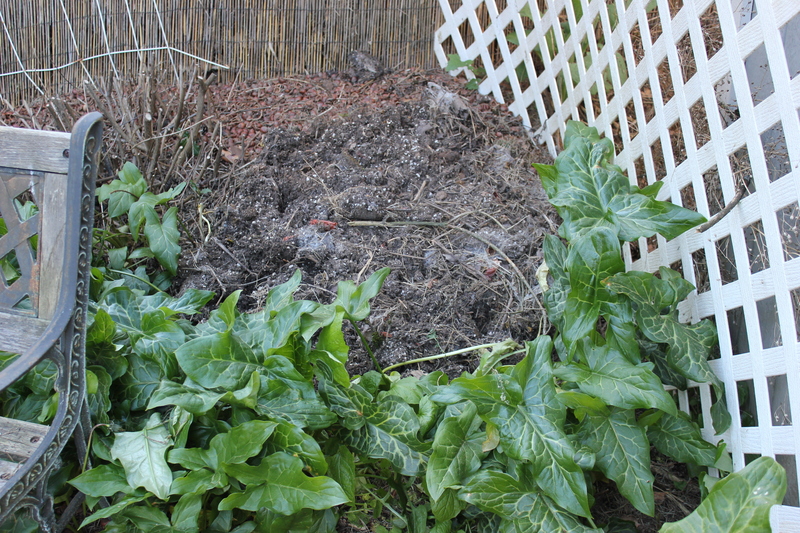 That’s the pile of compost I have managed to create since I got the bin – not much, but it has settled and composted considerably. Now I ache all over and I will probably drift off to sleep early. I don’t get to sleep in tomorrow. I don’t get to garden tomorrow, either. I would love to do both, but I have to go fight traffic and work at my Day Job. It’s been a great weekend, however.